Grate zucchini and carrots into a large bowl. Add cheese. Cut pea microgreens in two inch pieces and add to the bowl. Beat eggs, flour, garlic powder, salt and pepper in a small bowl. Pour egg mixture over vegetables and toss to evenly coat. Scoop spoonfuls of mixture onto a lightly greased sheet pan. Pea Shoots are packed with fiber and protein, putting them into our SUPERFOOD family! Pea microgreens (or pea shoots) are quite different from the other micros we have discussed in earlier weeks. When I compare pea microgreens to fully matured peas, I laugh. The two are so polar opposite from each other but taste very much the same. So why are peas so amusing to me? First, are peas a fruit, a vegetable, or a legume? I grew up believing that peas are a vegetable because they are green and my grandma made me eat them, so for the sake of this conversation, I am going to continue calling peas a vegetable. As a fully grown vegetable, peas are one of the smallest you can find. That is not the case when looking at microgreens. As a matter of fact, it is quite the opposite. The pea microgreens grow over four inches in 7 days. 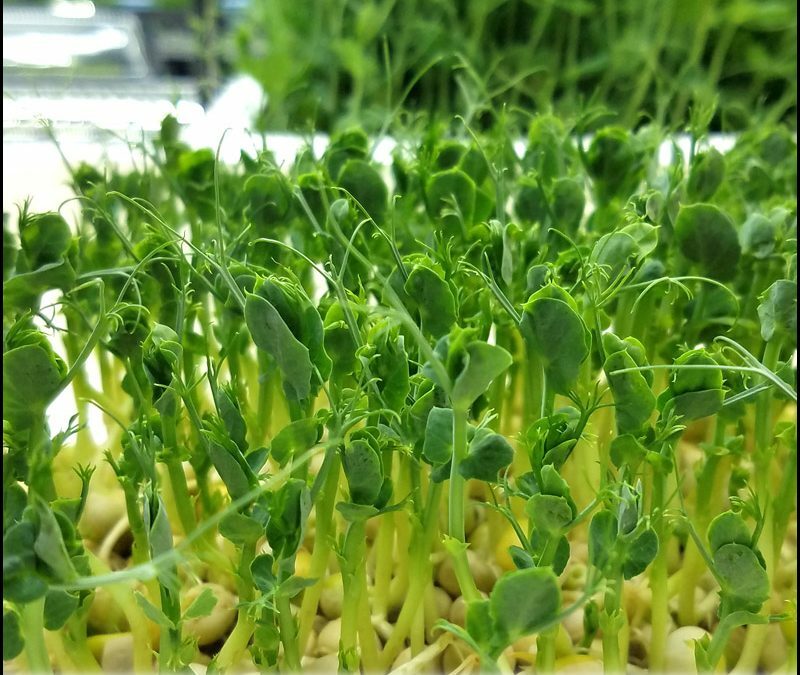 Pea shoots are one of the biggest microgreens that can be grown. Adult peas end up being on the delicate side, while pea shoots are quite hardy and durable. Both are tender and sweet. When Gram said, "Eat your peas, they are good for you," she was not kidding. Pea shoots are incredible sources of antioxidants, phytonutrients, enzymes, oxygen, minerals, and vitamins. Pea microgreens support your immune system. They ensure proper cell regeneration and help to alkalize your body. 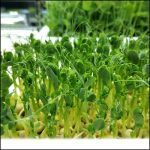 Unlike other microgreens, pea shoots are a great source of protein and fiber. Pea microgreens are high in antioxidants. Peas are full of beta carotene, folic acid, vitamin A, and vitamin C. One cup of pea shoots has seven times more vitamin C than a cup of blueberries four times more vitamin A than a cup of tomatoes. You get about 35% the daily value of vitamin C and 15% the DV of vitamin A from just one cup of pea microgreens. One of our pea shoot boxes should yield 3 - 4 cups. Don't forget that vitamin C plays a big role in keeping our skin healthy. Vitamin C helps the body make collagen. Collagen gives our skin elasticity and smoothness. Vitamin C also helps eliminate free radicals like second hand smoke, pollution, and UV rays. That means glowing, younger looking skin! Vitamin C helps our body to be a fat burning machine. Eating foods rich in vitamin C is beneficial to weight loss. These are just some of the incredible benefits we receive when we add pea microgreens to our daily diet. These are just some of the things that make pea microgreens a super SuperFood in our book and Super beneficial to you. As my grandma would say, "Eat Your Peas!"